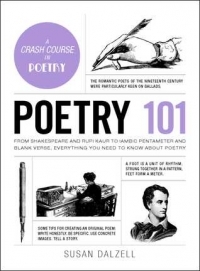 POETRY 101 by Susan Dalzell is a comprehensive introduction to poetry written in the English language. The book takes us all the way back to the Anglo-Saxons and BEOWULF and brings us through every movement that has transpired since, including the social media poetry that is being produced today. Dalzell moves at a frenetic pace, giving us readers a quick taste of what shaped style and preferences over the years, highlighting not only key players in the poetry space, but also major themes and rhythmic choices. At the beginning of the book, Dalzell explains “how to read a poem.” Having grown accustomed to the contemporary non-rhyming, prose-like poems, this section is incredibly helpful for me in understanding earlier work and how meter functions. Unfortunately, I don’t get to put my newfound knowledge to the test as Dalzell doesn’t use many examples. Perhaps including published poems is difficult for copyright reasons, but without them, I can only read about what a poem is intellectually. This trend, unfortunately, continues throughout the book, so though I conceptually understand what an elegy is, for example, I haven’t been exposed to one yet. Dalzell also briefly touches on Ancient Greek and Roman poetry since it inspired the English language poems that came after. However, besides a passing mention of Haikus, she never addresses any other poems from other countries. While I’m sure there is enough material on other cultural poems for completely separate books, it would have been nice to have some idea of how English language poems fit into the global sphere. With that being said, POETRY 101 does a great job at providing readers with the need-to-know basics. It is a wonderful entry point for anyone who has ever been interested in poetry or its history, especially during a time when poetry is in a resurgence. I appreciate how easy this guide is to read and I love getting to know some of the characters who shaped and influenced this art form. I would definitely recommend POETRY 101 to history lovers, artists, and English literature aficionados.